"Dear God," (I pretty much always begin prayers like I'm writing a letter), "please help me to do a good job teaching today. Help me remember that it isn't about me. Help the children to open their minds to a different language and help them to understand. Help them to have fun with the activities I've planned for them and help my classes to be a blessing for them and their future. Amen"
I'm driving in my car on the Pan American Highway to my pre-school English classes. 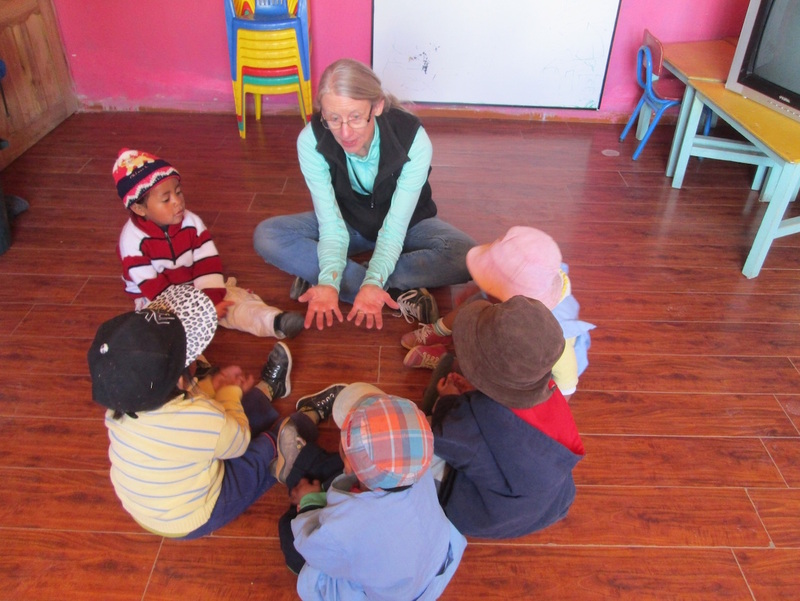 Saying a prayer helps me remember that my classes don't need to be perfect, that I was called to do this, and basically, by all appearances, the children seem to like the classes even if they aren't speaking fluent English after just a few lessons. (Duh!) So often, I feel inadequate. But no one is likely to fire me as I'm an unpaid volunteer. Of course, I suppose if things always went poorly, they might ask me not to come back. That's why I always mention it's not about me. For 6 years now, I have been teaching English to pre-schoolers and this year, it has finally felt that my English program balances fun, nouns and verbs, easy to more difficult. It is sad to think it took me this long to develop a really good program and still, there are times I can tell I miss the mark. This happens when the class material is too difficult (sometimes I seem to plan for kindergarteners instead of 2 to 4 year olds). If I wasn't supposed to be doing this, I think God would let me know by my life here in Ecuador not feeling good. I try not to wonder how teaching pre-school English is doing God's work, but I guess it can be. The feedback I get from the children, the teachers, and Blanca (executive director of FEDICE) tells me what I do is worthwhile. English is usually a key to a better paying job here in Ecuador. It should be no surprise that parents want their children to learn the language. And, I suppose it's even less of a surprise that the youth could care less. So maybe, just maybe, getting a good exposure to the language when one is really young and English is fun, might be helpful in spurring interest and making it easier to learn when older. their names on their image. It helped me remember more of their names. This fall, for 8 weeks, I have been working in two different districts at a total of 11 pre-schools. Class sizes range from 7 to over 20 students. When I walk onto campus and the children begin to see me, I often overhear "Marilyn" or "Ingles", or "Good Morning" or "I'm fine". They are alerting their teachers and fellow students that I am here. As they and I walk into the classroom, they run up to shake my hand and say "Good Morning" and some of them manage to do it two or three times before their teacher tells them to sit down. "Sit down; stand up; and clap, clap, clap." a song we sing. 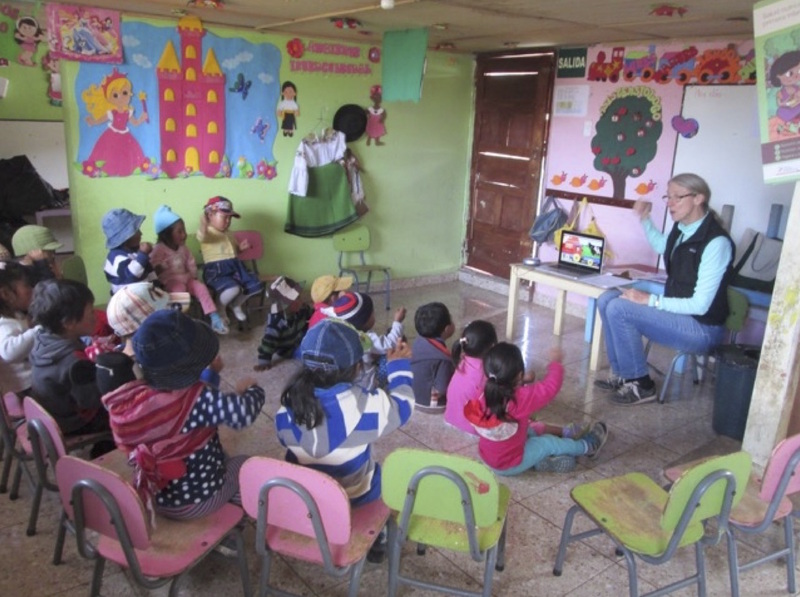 In the 25 minute classes, twice a week, we sing songs in English; we watch and sing to videos in English; we play simple games that reinforce English words; and we practice English words while looking at pictures. My classes are part music, part gross and fine motor skills, and part language. The older children are verbal, but in some classes the teachers have decided to include the almost verbal children as well. The latter tend to watch what is going on, not quite understanding at first. As they get used to me and the classes, they mimic what the older children do and sometimes catch onto the words even quicker than the older children. Jenifer comes from a very impoverished home. She has been exposed to English now for nearly 2 years. Mainly, she observes. Sometimes, I wonder if maybe she has some retardation or autism. In the last 2 weeks, she has begun to use her arms when we do actions to the music. And once, I heard her say "Goodbye" very quietly. She might just be a late bloomer. Her first year in my class, she was afraid of me, but now I can pay more attention to her because she is no longer fearful. She, like all the children I work with, surely can feel that I care about them. And if I am a carrier of God's love, maybe that is why an elderly, retired, former physical education teacher and grants writer can help pass on the concept of an unfamiliar language to a whole lot of pre-school children. "Whooo, whooo!" As the animal train begins, we're blowing the whistle. The children are looking at the video on my computer. When we sing a goodbye song and it is time for them to wash hands before breakfast or lunch, or to go back to their classrooms, or to go outside to play, they again like to shake hands and say "Goodbye" or "Ciao". The interaction is good for all of us. The children enjoy the activities and are glad to see me the days I come to teach. One teacher told me the children miss me when I do not come. A mother told me her daughter sings songs in English at home. Another mother whose child is now in elementary school, but had classes with me several years ago, said her child knew the names of animals, colors, and numbers in English already when she began English classes in first grade. Glenn and I will be spending Thanksgiving in the U.S. later this month. I taught my last class for 2015 today. I can tell that some of the teachers were sad that I won't be coming until 2016 for more classes. The children will probably benefit from a break, but will be glad to see me when I return early next year. smallest and youngest class. When no one is ill, I have seven students. As a former physical education teacher and then grants writer, I am not sure why God chose me to teach pre-school English. But it has been fun creating a curriculum and interacting with the children, even though I may never see the benefits of teaching them. That's the life of all teachers, though. Most of us never know if or how we have made an impact. Oh, you've definitely made an impact! See you when you get back! Lovely! The children are darling. And you are NOT elderly. I would enjoy visiting with you; please let me know if there is a time I could drive from Houston and spend a day learning more about your life and teaching in Ecuador. 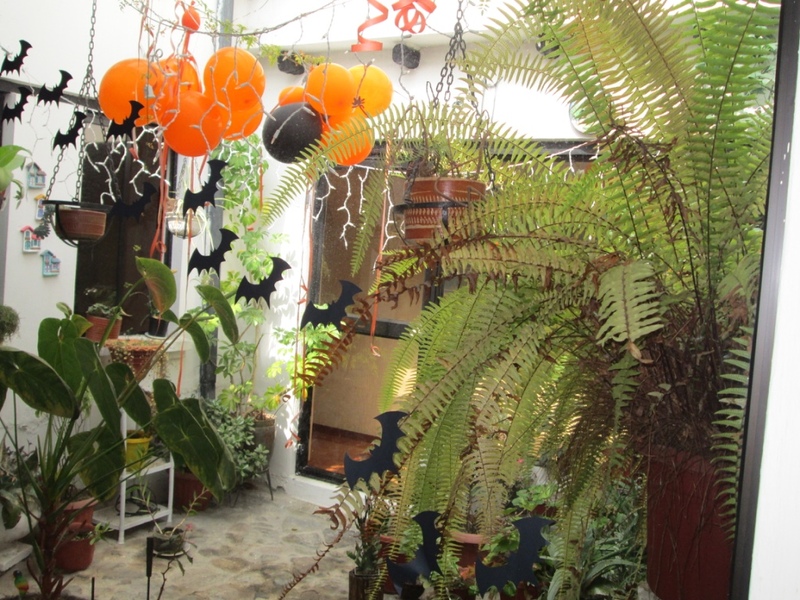 Ecuador doesn't celebrate Halloween too much, but it is slowly creeping - crawling - its way onto the long list of fiestas in this country. There are even a few places where one can buy Halloween decorations now. Halloween has been slow to catch on here for good reason - it conflicts with a couple of existing holidays. One is Día de Los Difuntos on November 2nd. In the U.S., we call that day All Souls Day. It's observed much more religiously here, however, because 90% of the population is Catholic. October 31st is also the beginning of Independence Day celebrations in Cuenca. Cuenca is a city in southern Ecuador now, but I guess it used to be kind of like a city-state. 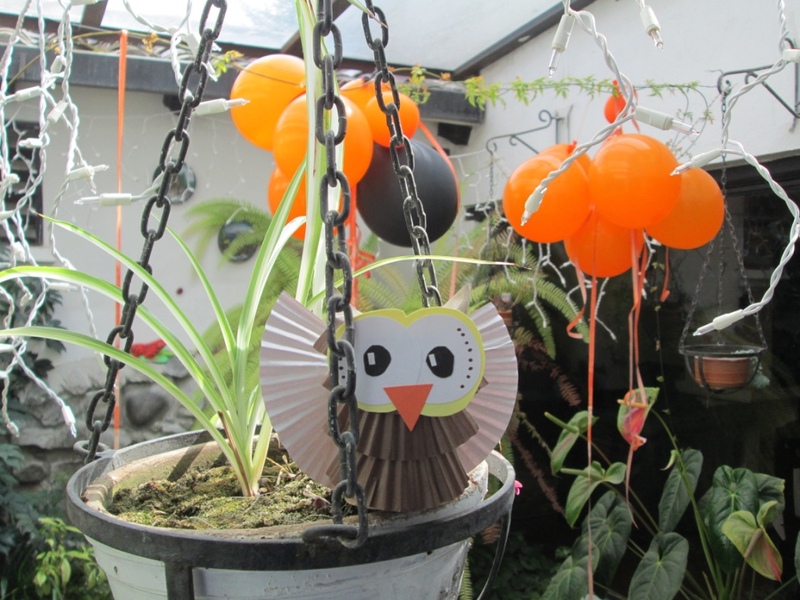 There's a good article about how Ecuador is beginning to embrace Halloween here. 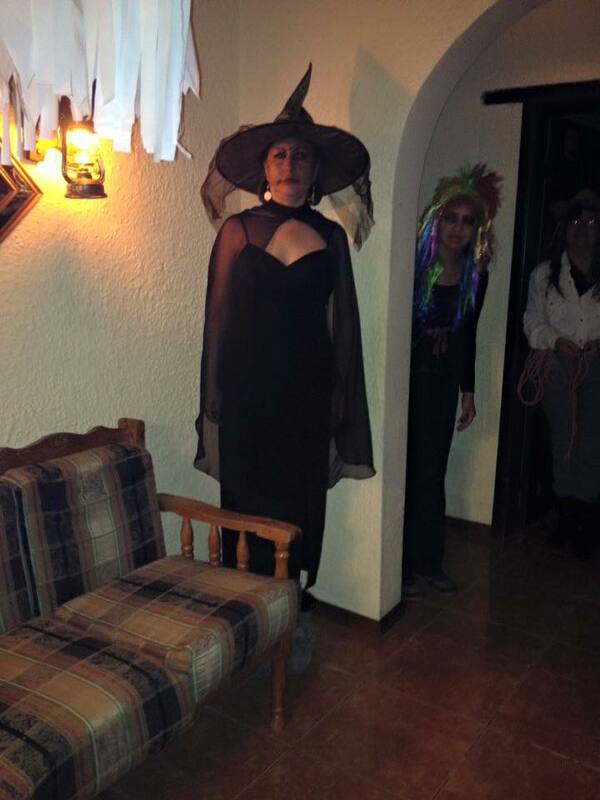 I read that some expats in Cuenca, Ecuador had a Halloween party at a bar. How boring. 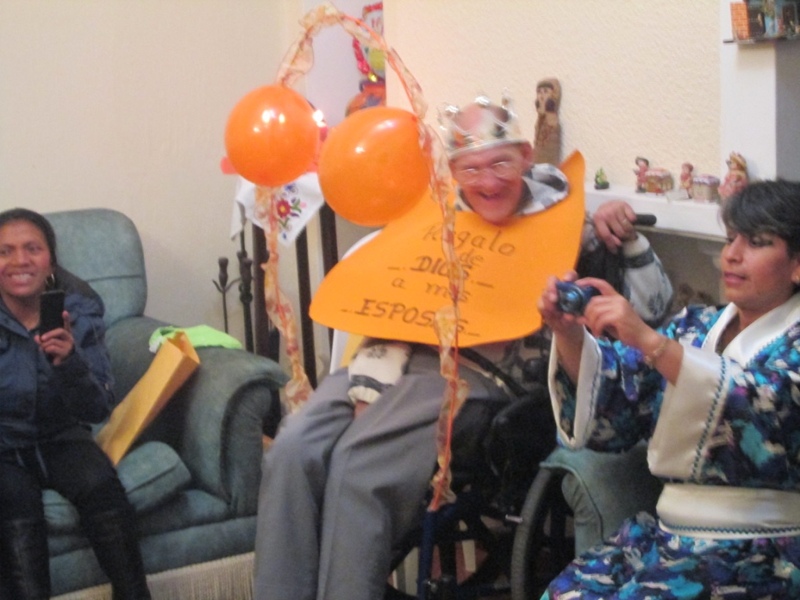 Last year we invited a few children we know and their parents to our house for a Halloween party. I'd guess we had 15, maybe 20 people in total. We turned our home into a Haunted House for that one. Both children and adults were blindfolded and led into different rooms of the house. They were encouraged to touch different - creepy - things. One room was home to Tiger Eyes (whole grapes in gelatin). They found rat intestines (spaghetti) in another room. We can't remember what was in the third room, but it was equally as gruesome to a blindfolded child. Most people really enjoyed it, so we decided to do it again. 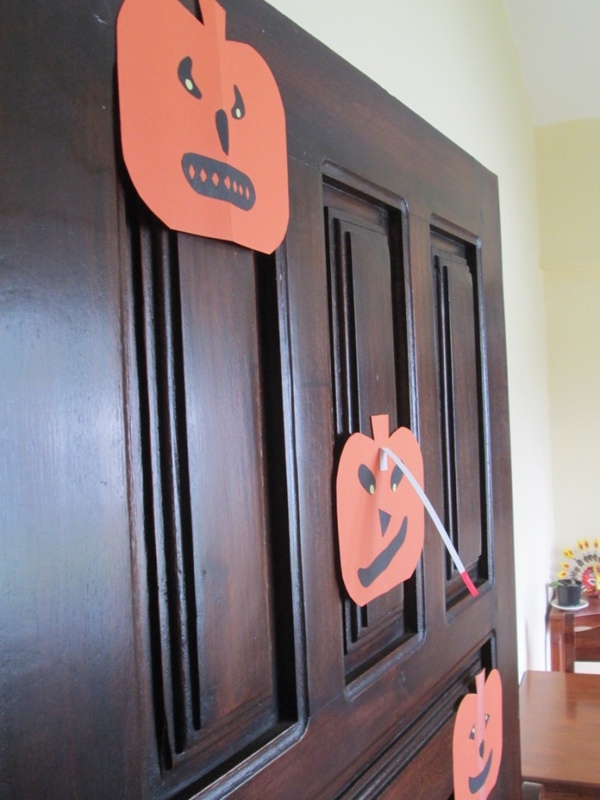 However, a couple of the children got scared last year, so we did away with the Haunted House aspect. Bats In Our Atrium! Oh, Nooo!! 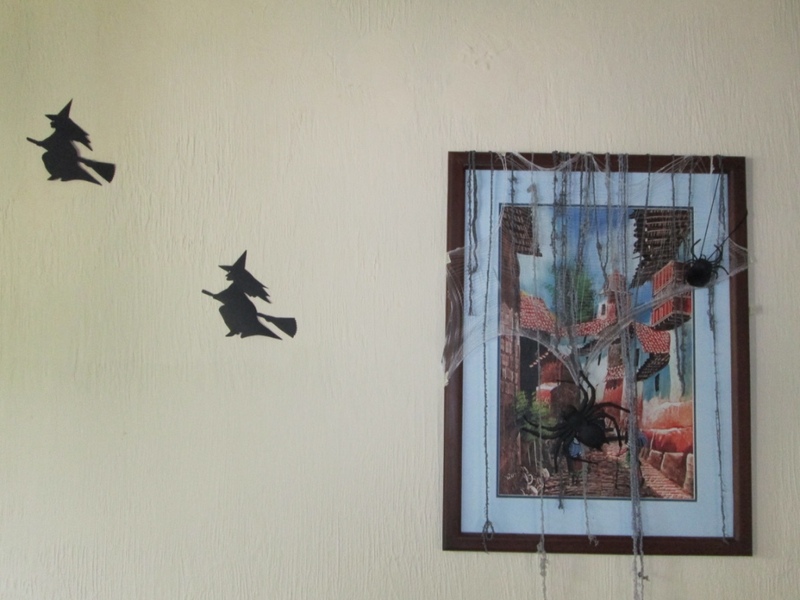 Witches From Spiders? Oh, Nooo!! Marilyn and Isabel started planning the party at the end of September. When Marilyn found some ideas on the internet for making decorations, they were both giddy with excitement. I didn't quite understand. Maybe it was because I'm a male of the species. I figure that if you want to have a party, the steps are as follows: 1) buy food, 2) buy drink, 3) invite some fun people, 4) buy a few decorations (optional), 5) prepare the food and drink, 6) let the party happen. I must admit that, if decorations are required, making them is far easier on the pocketbook than buying them. I was pretty much left out of the decoration making and decorating due to my buying mentality. But I was not completely left out. Many times, I was yanked away from my computer to see the newest pumpkins, owls, ghosts, witches, and bats that had been made and put up. (Ecuador has calabazas (pumpkins), but they're not grown at the right time, which is why Isabel and Marilyn were in the pumpkin-making business.) They roped Patricia, Isabel's sister who often stays with us now, into helping. They also got Brayan, Nataly, and Alissón to help make decorations for the party. I was asked to design a pumpkin myself. Having no better idea, I gave it weird characteristics, including a crooked smile and a "headfinger" which I, being disabled, use for typing. Since we weren't doing the Haunted House routine again, exactly what would we do? Marilyn and Isabel had no trouble cooking up other activities, believe you me. The children who wished to do so could make their own fantasmas (ghosts) to take home. 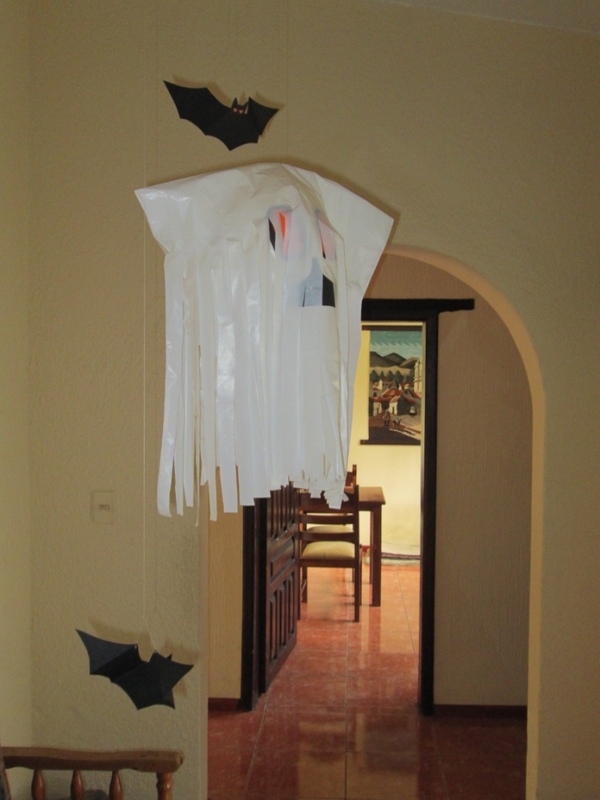 The craft involved two white plastic garbage bags, a balloon, and construction paper. Those who participated had fun and got to make friends around our kitchen dining table. There was also a chance to win prizes for the best costumes. The contestants were placed into three categories - adults, teenagers, children - to make it fair (to the adults.) Who wants to go up against a five-year-old spiderman? Or a nine-year-old fairy? Each category had 1st and 2nd prizes. We picked three people who had not come in costumes to be judges. Marilyn's plan was to have the contestants parade around the house (barring rain). Their costumes would be judged as they passed by. Isabel had a better idea at the last minute. She asked the contestants to line up outside the living room and walk in one by one to model their costume for the judges. It looked like a fashion show. Pretty soon, the major fun purveyor in Isabel's family entered. Cesar was dressed as an old man with a hump on his back. As he modeled, he stumbled to the floor and used his "walking stick" to get up. After that, the contestants not only modeled their costumes, but also pantomimed their personas. It was so much fun. The fashion show turned into theater. I didn't win and neither did Marilyn. We were grateful for that because we avoided the appearance of favoritism. (But, between you and me, I had a GREAT costume. Almost as good as my outhouse costume. I'll tell that story if at least five people request it in the Comments section.) 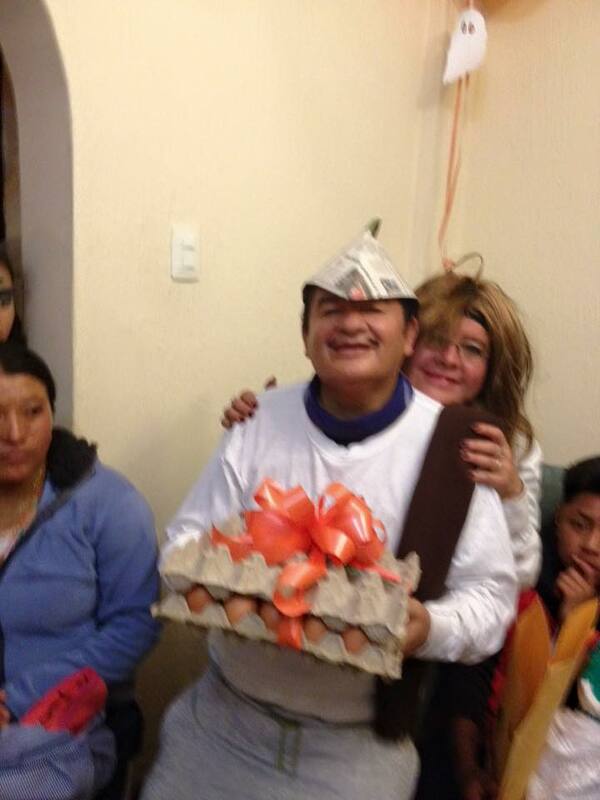 My costume this year included a sign that said, "Regalo De Dios A Mis Esposas (God's Gift to my Wives)." We joke here that I have eleven wives because that's how many women (including my computer) help me out on occasion. What's a Halloween without Trick-or-Treating? That was a bit of a dilemma because you just don't see such a thing in Ecuador. At least, not in Otavalo, where we live. Usually, I'm the problem solver, but Marilyn solved this one in elegant fashion. She found a bunch of discarded manilla envelopes in a neighbor's trash. Before the party, she and whoever else would help, decorated them. Voila! Fancy Halloween loot bags. We have two bedrooms and an office downstairs. Marilyn simply stationed someone in each of those rooms with treats. Every person with a Trick-or-Treat bag went to each closed door, knocked, and screamed, "Trick-or-Treat," a phrase Marilyn had taught them beforehand. The Trick-or-Treaters included many adults, of which I was most certainly one. It was a good thing we had decided to serve the food buffet style because their were 42 of us in all, including 14 youngsters. We decided to do it KISS-style (Keep It Simple Stupid.) We only had gelatin, something to drink, and hot dogs. All the trimmings for the hot dogs were on the buffet table, including some from Ecuador I had never heard of like crumbled potato chips (yummy). As a bonus, Gaby, Isabel's daughter-in-law, came from Quito with Martín, Isabel's first grandson. 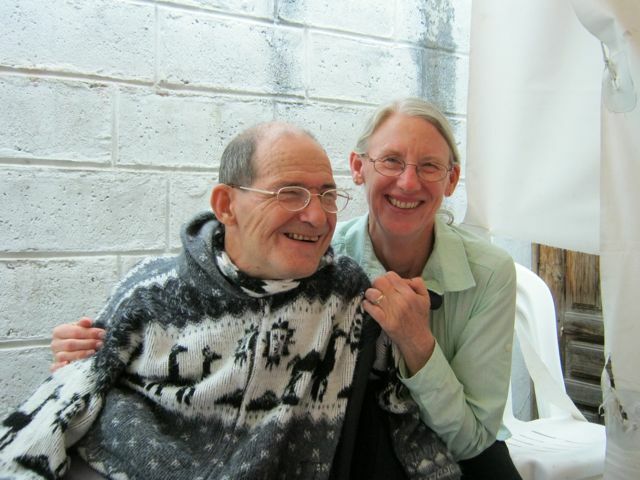 He had only been born on October 6th and this was his first visit to Otavalo. I'm pretty sure it was his first time out of Quito, period. Isabel had a wonderful time showing Martín off to family and friends. He was in a clown costume. Given the propensity of his family for having fun, it seemed he'd be destined to carry that into a new generation. Eric, Gaby's brother, also came with her. (Elvis, Isabel's son, had to work.) Eric was visiting Ecuador for three months because he's been living in New Jersey for three years. 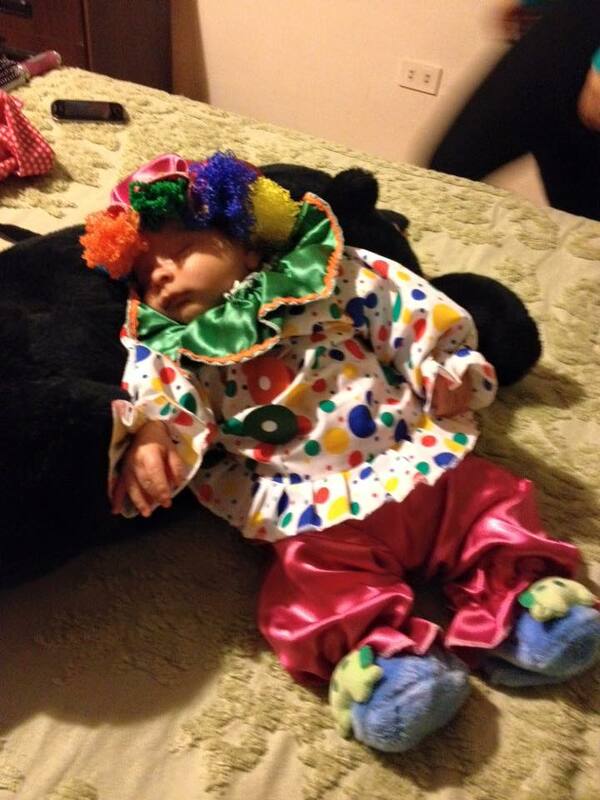 He told us that, despite living in New Jersey, this was the first Halloween he'd experienced, and he really enjoyed it. 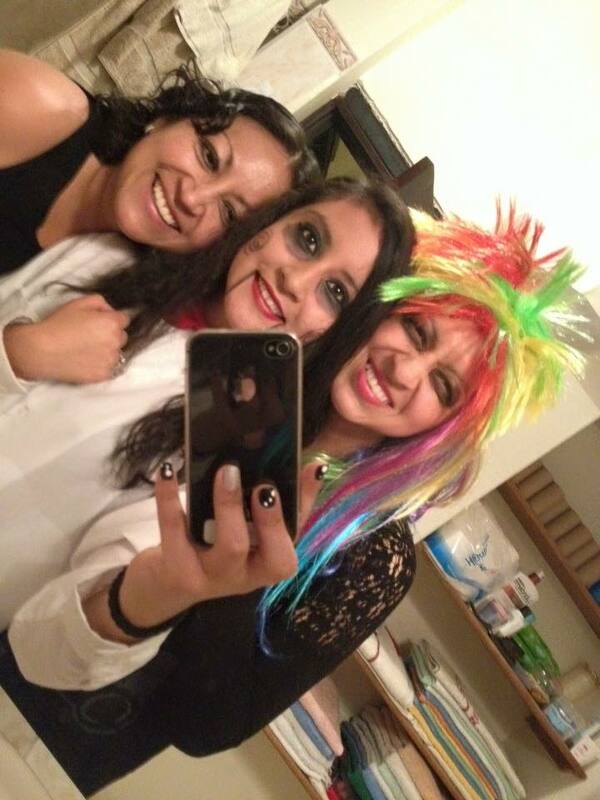 We'll probably have another Halloween party next year. Lord knows what we'll do at that one. Bob for apples? What a fun party! 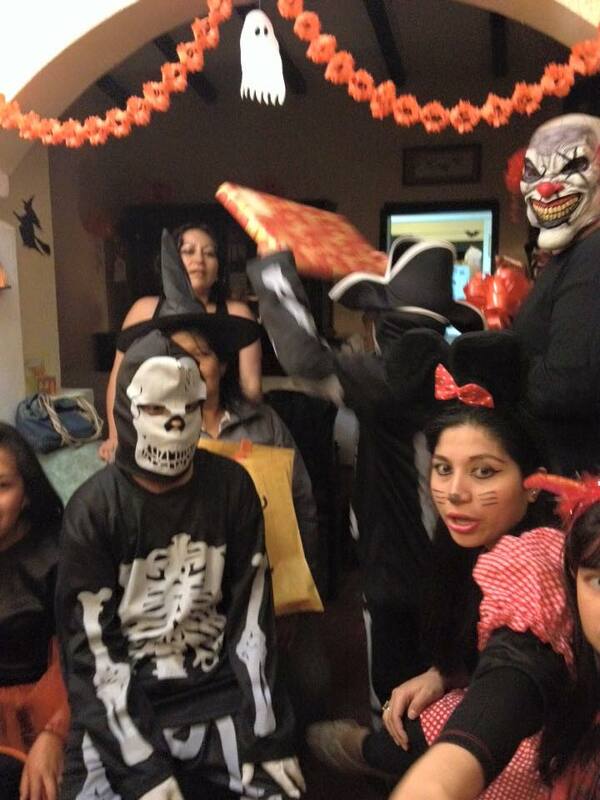 I can't make out what Luis' costume was, but I see he won the prize in adult category. I would have enjoyed seeing you dramatize your God's gift to wives costume. I was just glad they started dramatizing AFTER I modeled. Luis was dressed as a famous Mexican comedian. Appropriate? Unfortunately, I forget the name. Please enlighten us regarding the outhouse costume. That's one of the five necessary. By all means, the world is waiting to hear about your outhouse costume. Your party sounded great. That's two of the five necessary. You and Marilyn are true ambassadors to Ecuador. It sounds like you had a splendid party! What FUN!!! I want to see---or at least hear about----the outhouse costume. That's three of the five necessary. You guys really go all out! Sounds and looks like a great party.